The April 29 Show/May 7 in Boston: Cranktones, Barley Hoppers, Roy Sludge, Fearless Leaders, Bop Thrills, Johnny Carlevale, DJs Kogar and Easy Ed! The archive of last night's show is now available for download here! (The songs are listed below.) My radio shows are provided for free, but please support the current bands we play by buying their music and going out to see them live when you can. It's your support that keeps the worldwide rockin' scene on its feet. Thanks! 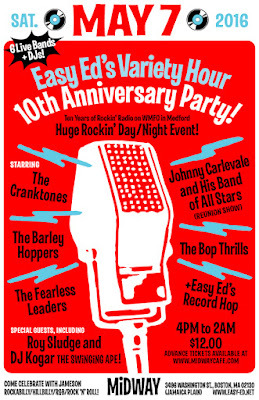 I hope to see many of you next Saturday at the Midway in Boston for the Easy Ed’s Variety Hour tenth anniversary party. Wow! Check out that list of bands and DJs. This is going to be a real rock 'n' roll show and I hope you'll be there to have some fun with us! Advance tickets are selling briskly. You can get yours here. 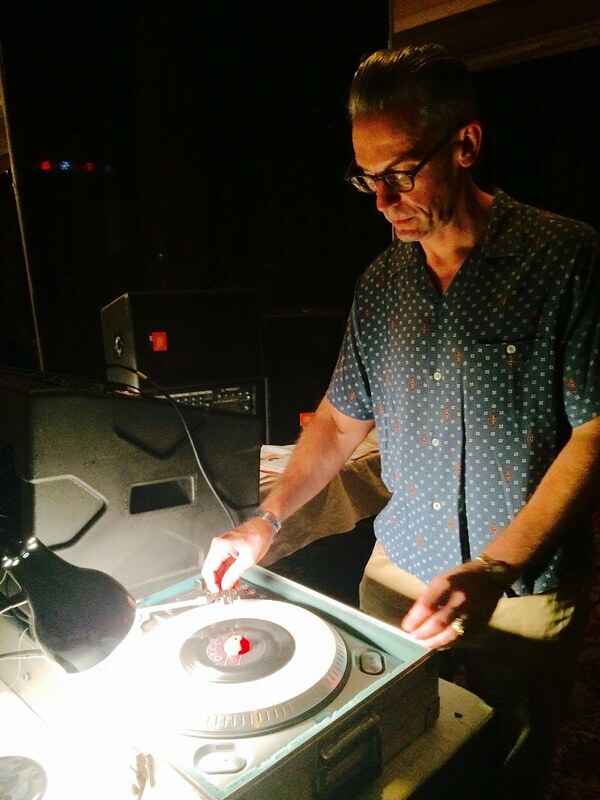 With DJ sets throughout the event--Easy Ed's Record Hop sharing the decks with Kogar the Swinging Ape! Here's what we played on the April 29 show. The Roy Sludge Trio “If You Can't Rock Me” from Too Drunk to Truck on DeeVeeUs Records — Note: See Roy Sludge May 7 at Easy Ed’s Tenth Anniversary party! Johnny Carlevale “My Baby Ain’t Home” from That Ain't No Way to Spend a Friday Night on Self-Released — Note: See Johnny Carlevale May 7 at Easy Ed’s Tenth Anniversary party! Lonnie Mack “Wham!” from Rock Instrumental Classics Vol. 2 on Rhino — Fraternity Records 1962/Rest in peace, Lonnie Mack. If you missed our April 15 broadcast--which I guess we can nickname "The Loco Show" since I unintentionally played three records with "loco" in the title--just click here to get to the archive on the podbean site. You can also find show files on my web site and on iTunes. See the end of this post for the list of songs we played. Unfortunately I could not make it to the Viva Las Vegas festival this year, but it was cool to see Tom Ingram's promo video containing some fun footage from the 2015 event. Keep your eyes open for a quick shot of me spinning records at the pool party (about a minute in). 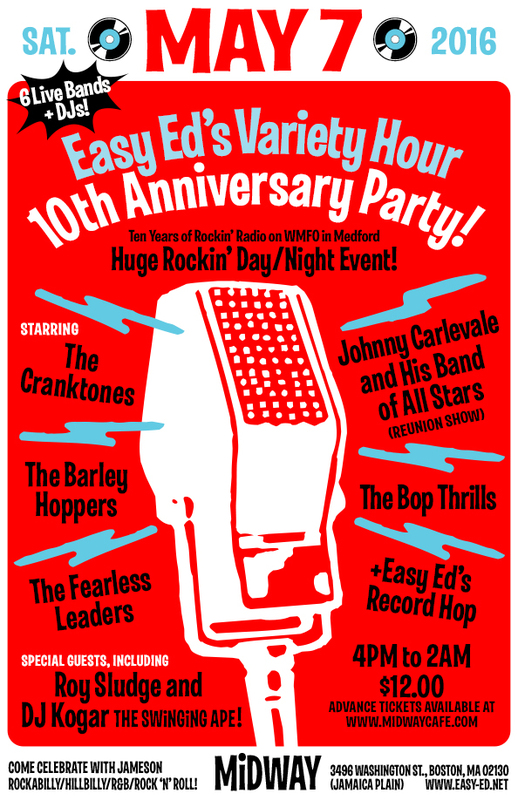 Advance tickets for the Easy Ed’s Variety Hour tenth anniversary party on May 7 at the Midway in Boston (Jamaica Plain) are selling quickly. Don't miss out! Get yours here. Check out this killer-diller-no-filler line up! As always, thanks for your interest in the show. We couldn't do it without you! Here's what we played on the April 15 show. The Dave and Deke Combo “I'm Gonna Tell” from There's Nothing Like an Old Hillbilly on Bucket-Lid Records — See them at the New England Shake Up (September 23-25 in Sturbridge, MA). Newenglandshakeup.com for info and tickets. The Cranktones “Right By My Baby” from Vibrate with The Cranktones on Rhubarb Records — See them May 7 at the Midway at Easy Ed’s Tenth Anniversary party! Looking for the archive of the April 1 show? Just click here for the free download. A reminder: You can also subscribe to the podcast on iTunes and/or get it from my web site. The songs played last night are listed at the bottom of this post. This week I'll be spinning records at two events. 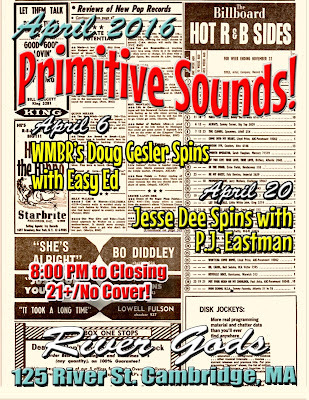 April 6 marks the next installment of Primitive Sounds--the long-running roots DJ night at River Gods in Cambridge, MA that I host with my good buddy P.J. Eastman. 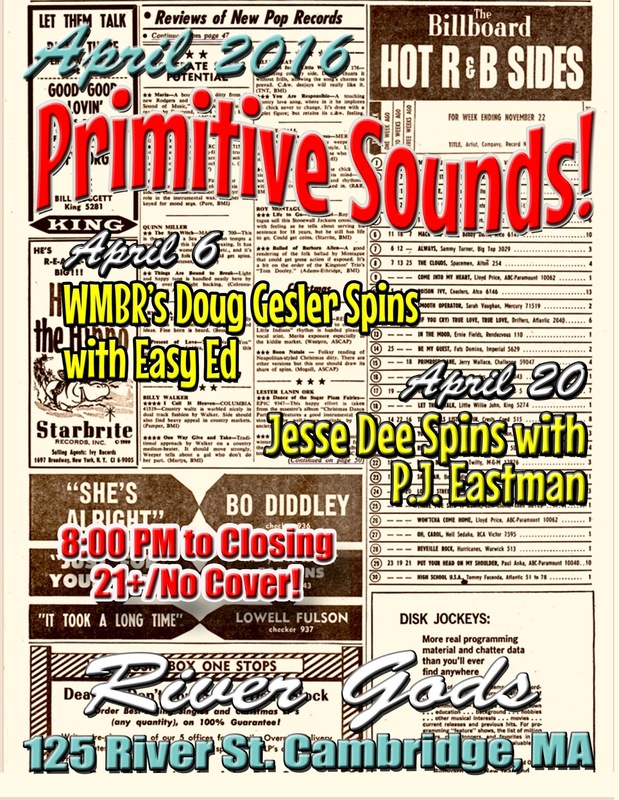 This time out I'll be sharing the DJ booth with Doug Gesler of WMBR's "Lost Highway" show. The records roll from 8:00 'til closing. Hope to see you there! 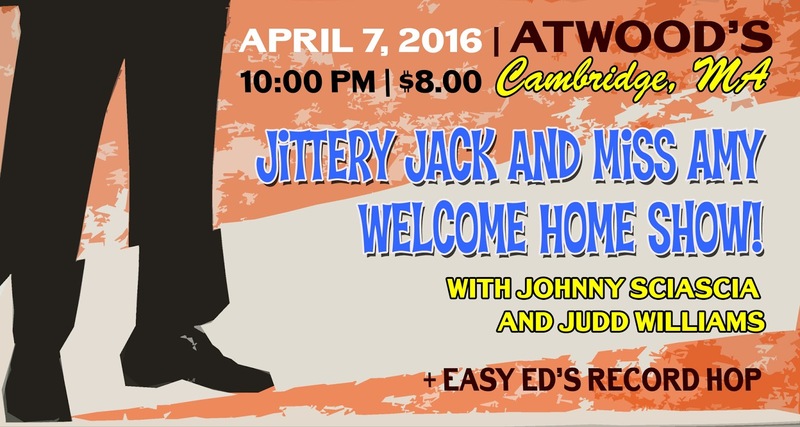 On April 7 we're welcoming Jittery Jack and Miss Amy back to Boston after their weeks-long U.S. tour with a rockin' show at Atwood's Tavern in Cambridge! The band--featuring Johnny Sciascia on bass and Judd Williams on drums--will play two big sets, and I'll be spinning platters early, late, and on the break. Rock on, folks! Have a great weekend. King Size Taylor “Bad Boy” from Various: Rockin' Race Jamboree 2015 on Sleazy Records — Decca Records 1963? Tooter Boatman and the Chapperals “Thunder and Lightning” from Various: High-Speed Bop on Ree Bop Records — Originally unissued--which is a crime! The Barley Hoppers “I Hear You Knockin'” from The Barley Hoppers on Self-Released — See them May 7 at the Midway at Easy Ed’s Tenth Anniversary party!